The program of Labsurlab dedicates almost 1/4 of the printed program to ‘palabras frecuentes’ or ‘frecuent words’. A lot of these words have been pronounced, illustrated during the conferences. The list is long with definitions mostly taken from wikipedia: collaboration, free software, free hardware, open code practices, laboratories, social networks, commons, p2p, DIY, DIWO, cartographies, communities, city, meeting (f2f), hacktivism, modularity, prototype, experimentation, copyleft, free content, horizontality, hacker ethics, recycling, permaculture, transdisciplinarity, critical reflection, degrowth, gender studies, opendata, performance, process, archive, remix, self-management, communities of wireless networks. Three of the speakers took the time to consciously put names and concepts to their practice (Marcos García, Medialab Prado, Madrid) and their residency and exhibition program (Roddy Schrock, Eyebeam, NY and Oscar Abril, Nauestruch, Barcelona). 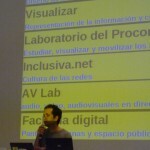 Marcos García of Medialab Prado coined ten concepts or protocols for a medialab, of which only some are not in the above listing. 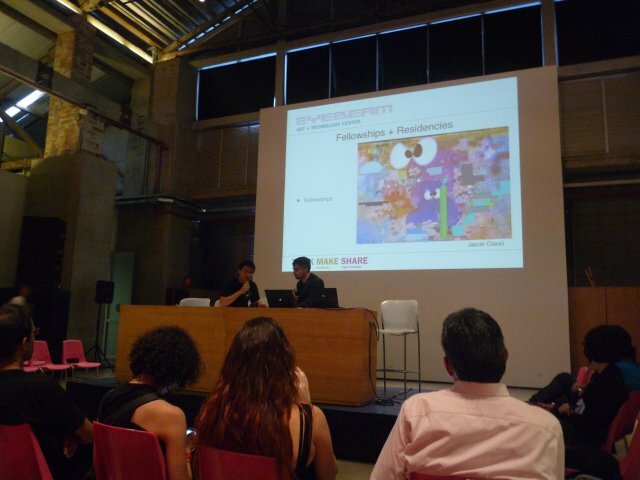 First of all, he introduced the ‘new digital disorder‘, because of the contemporary flux in categories as profesional/amateur, expert/beginner and how they continuously overlap, cross, cohabit; turning a production space into an exhibition and/or conference space. Secondly, he talked about ‘community‘ as a way to elaborate an idea in a collective way. 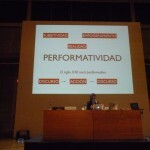 The residency program Interactivos is an example of this. ‘Prototyping‘ functions as a framework for experimentation, without the need for things to work. And there is the ‘operating system‘ that should be accessible to everyone and user friendly. 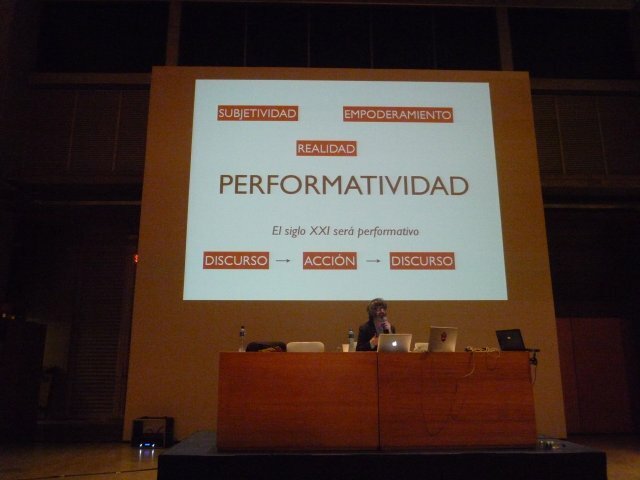 He used this concept to talk about the way Interactivos select artists (10) and collaborators (50 – can be anyone) who then work all together in one space during ten days. ‘Mediation‘ is key number five, or someone who facilitates the processes through direct communication and physical presence. ‘Granularity of participation‘ is a way to talk about the different ways of participation that should be possible in this kind of processes. For an idea to become stable, it needs different entries, going from different profiles of people participating to different degrees of expertise and a space where all these people can participate with different degrees of engagement. And then there is the ‘documentation of the process‘ that needs to be done on and offline. Talking about protocols becoming standards, there should be a degree of ‘replicability‘, as a method that can be translated to other places. 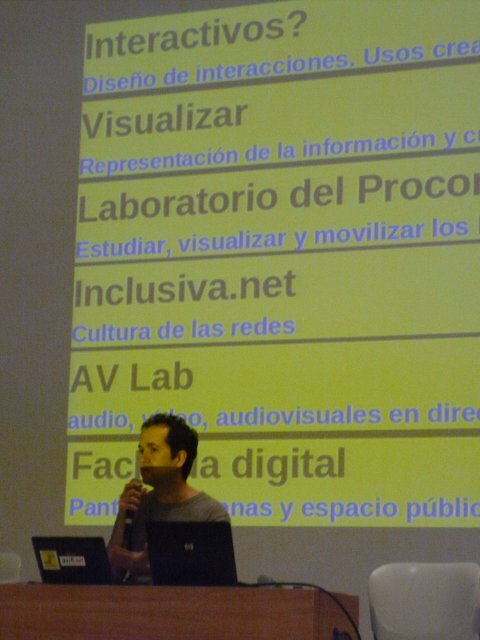 The formulas of Medialab Prado were already introduced in other laboratory spaces in Mexico for example. We then do not speak about a ‘laboratory’ anymore but about a ‘colaboratory‘, which is a nice new word to use. This means that there can be similar specificities in different places who collaborate using the web, this also means there can a special focus on the local work leaving space for the improvised, which is as essential to the work of the lab as it is to the energy of a party :-). And at last he spoke about the ‘commons‘, a concept that has been out of use since long and is now back into the discourse, thanks to the internet, as content offers by nature the possiblity to access, use, change, and remake. For more information, read David Harvey’s The right to the city. Roddy Schrock resumed the framework of Eyebeam in short keywords that no one will forget, as ‘think, make, share’ and ‘open source is key‘. As Eyebeam is financed by ‘everything’ they have had the question of the open source/free software on the table for years. It does not get solved, they leave it up to the artists to decide how much of their code is open and what kind of licenses they want to use. Their residency program and fellowship program is providing a large support to artists. Residencies run during 5 months, with a fee of 5000$ and 24h access to their infrastructure. A fellowship provides an artist with 30000$ + health care during 11 months in order to do deep research. 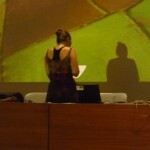 A fellow artist has to be present 4 days a week and help the team out with programming solutions f.ex. In the answer to the question that came from the audience about how he thinks to ‘exhibit’ these kind of works, he added the notion of ‘temporality’, ‘improvisation’ and ‘negociation’ with the artists. 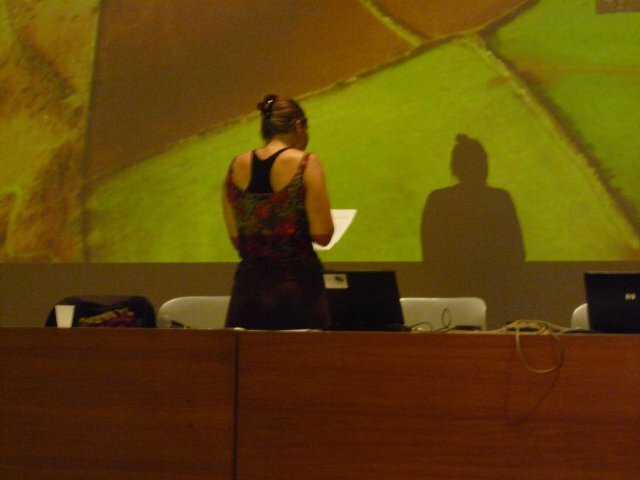 Just before Oscar Abril I presented Constant using 25 of the frecuent words of the list above. As always I included some other voices into the presentation, using espeak (very badly developed for Spanish :-( ) and a ficticious voice representing ‘Constant’ as a speaking organism. 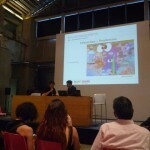 I had chosen to start from the context of the festival and adapt my ideas to that. It had taken me a lot of time to find the right composition for the lecture so I had no time left for rehearsal, which meant there was a high degree of improvisation in Spanish. Later that night I wondered how he will deal with the presentation of the degrees of ‘clumsiness’ that appear when people open up for process, improvisation and collaboration in their practices. In order to include these concepts, the artists need to create spaces that are ‘true’, this means spaces of insecurity where only the respect for and the acceptation of the insecure can make things happen. You are currently reading #Labsurlab – lectures – concepts at Paramoulipist.